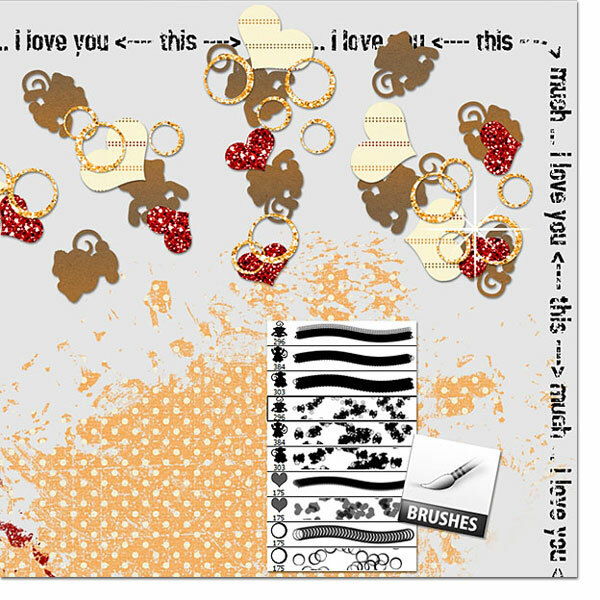 i love you this much, a very special announcement and a freebie! Sorry it's taken me so long to return, but with summer in full force, it's been C-R-A-Z-Y!!! I have been playing in Photoshop and even though I have Photoshop and Illustrator classes coming up, I still like teaching myself, which is usually the way I learn most things. Thus the reason it takes me longer to appear here with the goods! ROFL! April, my firstborn, was born with a nurturing spirit. She has been a little mother ever since I can remember and she helped me in raising my youngest, her twin brothers, Luke and John! In fact, she once commented that she felt the boys to be more like her own children than her brothers! That says a whole lot right there, eh? The photo showcased in my little monkey's arms was emailed to me the day before yesterday after a visit to the doctor. 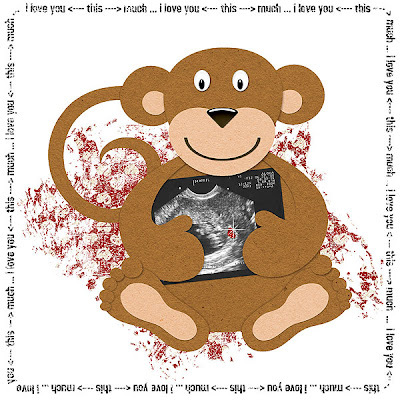 Baby Buckmier is 9 weeks, 5 days in gestation, between the size of a grape and a cumquat and April was able to see his/her itty-bitty arms and legs moving about in the womb! Baby is upside-down and you can see the tip of the red glittered heart pointing the way! To any of you reading that might be trying to get pregnant with a little extra help, I am sending positive thoughts and prayers your way! I told April that I am only thinking good things just as I did when I found out I was carrying twins and every book I picked up informed me of the risk of this, that and the other thing. I took all of those books back to the library and stood in faith that I was going to have healthy babies! I carried Luke and John full-term and they weighed in at 6 lbs, 14 oz (same weight as April at birth:) and 6 lbs, 2 oz! So, I've been dabbling in brush making for a bit now and decided I wanted to make some cute little monkey scatters to go into the extras edition of *Monkeying Around* for y'all. Well, one thing led to another and then another and voila, I created my very first brush set and guess what? Y'all are going to get it! I was so excited when the lovely, Trina Clark agreed to let me share the set with y'all since the cute little monkeys I have created were done so using some cutting files I purchased from Trina last month. *Monkeying Around* brush set includes an ABR file with dual versions of five brushes and individual PNG files for those unable to use ABR files. As the image above shows, each brush offers both a single shape tip preset and shape dynamics and scattering presets, which are fabulous for some easy scatter creating on your canvas. Naturally, you are able to play and adjust the settings to your liking if you wish! TOU for the brushes is the same as for all of the other files. You may use them for personal-use, scrap-for-hire and scrap-for-other. Please read TOU for specifics! I've also included instructions for saving and loading them into Photoshop. Wishing you all a spectacular summer filled with sweet scrapping memories and to my fellow Scraplanders on the opposite side of the equator, a wonderful winter of the same! I love you <---- this ----> much! Sky Drive has changed things up a bit since my last post and I've finally figured it all out. I am not able to give you a separate link for each file, unless I create a file for each link and that is just a bit too time consuming. The alternative is actually a win-win for all of us as I can now put all links into one folder and you are able to download as many or as few of the links as you wish to! Click on the link you wish to download and a download window will open as before allowing you an instant download. The fourth and final link is a download them all at once! As always, I appreciate your feedback here in the comments sections on my blog! 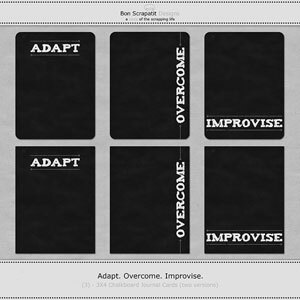 Thank you and Bon Scrapatit! Our grandson, Jace and Robert doing a little monkeying around of their own! I lost my back up computer after having shut down for the thunder and lightning storm! LOL! No, I don't believe it had a thing to do with the storm, it was simply it's time to go! Yes, the images above are from a sequence of photos I took while Jace and Robert were enjoying some play time together! LOL! The two had a day of it for sure. They golfed, filled in gopher holes, watched educational videos, Spiderman, The Land Before Time, chatted outside with Uncle Matt while he was standing on the top of a mountain he climbed in Dutch Harbor, Alaska and had a rather lengthy pillow fight! Can we say F-U-N! Hope to find y'all scrapping to your heart's content! Thank you all so much for the sweet comments. I shall be catching up (once again!) with those tonight I hope as well as finishing up a little goody for y'all too! I've dashed in to announce to you a most amazing deal on some incredible Photoshop and Illustrator classes being given by the infamous Andrea Gold over at Go Digital Scrapbooking! 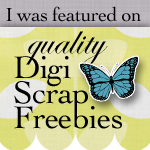 For those who are newer to Scrapland and digital scrapbooking, Andrea, in my recollection, is the first digital designer to start giving out free templates via her blog several years ago. I believe this was before she actually started designing kits and such too, but don't hold me to it! Anyhoo, Andrea's store at GDS now boasts of some 1,000 templates! Yah! Amazing, eh? My head was swimming when perusing her store the other night as I'd not been to visit in some time. I've always wished to take some of Andrea's Photoshop/Illustrator classes, but just haven't been able to afford to do so ... until now! Well, I really, really cannot afford to but, with the deal Andrea is offering through tomorrow (meant to post on weekend but had to shut down), June 8th, I simply cannot afford not to! Happy Birthday to me! With my designer anniversary on the first of June and my birthday coming up this weekend, I decided to gift myself (Robert is helping out too!) with the purchase of (5) five classes at half price! Classes are normally $30 and are now only $15 through tomorrow. Good deal, eh? I'm not finished yet! Through tomorrow, June 8th, for every class you purchase, Andrea will send a coupon for a free class! Yes, you read that correctly ... a free class! So, classes are currently selling at half price - $15, with a coupon sent for a free class which makes the class only $7.50! You simply cannot beat that price anywhere that I know of and I've scoured around for a long time. Check out Andrea's Photoshop classes here and make sure to read down where she lists all that she covers in each class. All you need to do is look through Andrea's store and you can see her mad PS skills at work! She's got the Photoshoppin' down to an art! *smile* Well, not to mention Illustrator too! Check out the Illustrator classes here. Even though I've been designing for four years now, I am self-taught and I am very sure that I do many things the hard and/or long way, so I'm starting with the Beginner's class so that I do not miss out on anything! Y'all know me, I love to be as thorough as possible! LOL! Note: There are also Photoshop Elements and Paint Shop Pro classes available at half price, however, they are taught by other instructors and do not include the same buy one, get one free offer as Andrea's. See Andrea's blog for detailed information on receiving your free classes. You will also find via both Andrea's blog and store that she is having a drawing to win her entire store plus two other prizes. Each $5 in purchases gives you one entry. Unlimited entries. Entries are from any purchase made in Andrea's store from June 1st - June 30th. Just remember that the deal for BOGO Photoshop/Illustrator classes by Andrea Gold ends tomorrow, June 8th! Scrap happy and I'll see you soon! "monkeying around" ... june blog train goodies are up! yay! Happy 1st day of June y'all! I am so, so sorry for being so late in getting my goodies posted for the June Blog Train, *Monkeying Around*! I have been up for two days straight (no sleep, not even a cat nap), trying to get everything ready to upload. ROFL! Please don't ask (I'm sure you won't! ), but it's just been one little thing after another. My computer is being backed up and I had maxed out my RAM so it was painstakingly slow in getting all the files finalized, together, TOU prepped, etc. I was supposed to remove *The Wild Ones* yesterday, however, due to my tardiness, I am going to leave it up until tomorrow (preview and link can be found on my sidebar to your right) in the event there is anyone who still wishes to download it. Those of you who have already downloaded and left me feedback, a thank you or some love, thank you so much! Appreciated more than you can know ... or, perhaps, you do know! Before I post the pertinent info for the blog train, I just have to tell you before I forget! Today is my fourth anniversary as a digital scrapbooking designer! Woot, woot ... yeah! It is difficult to believe that I have been blogging and giving away goodies for almost four years! My blogoversary is near the end of August and I hope to hoop it up real good with y'all this year! Okies, without further ado my wonderful and patient friends, here's the official blog train scoop! In checking Angel's link, she still has not posted so make sure to head back over in a day or two. Please take a moment to say, "thank you" to all of the amazing designers who have contributed to this month's blog train. Everyone works hard to make this happen, especially our fabulous conductor, Trish Heffner. You can give her a heartfelt thank you right here on the Blog Train Blog, which is also where you will find all 90+ links of the contributing designers starting with hers! Once again, I thank you for your patience is awaiting my post. Y'all rock ... and then some! Uploading my freebies to Sky Drive is giving you a direct download and no more frustration in waiting for 4-shared. In doing so, I no longer have any way to track how many downloads I receive, which helps me to know what you like and what you don't! I simply ask that you leave a quick thank you either in the comments section here on my blog (not the one on Sky Drive!) or in the chat box as a form of feedback. i think i can, i think i can ... the little train that "could" and "will"! Jumping the track to let you know that I will have my part of the June Blog Train posted in just a short bit. I have struggled all night with a less than cooperative computer that is being backed up and slower than molasses. Quite frustrating to say the least as a snail can crawl faster than Photoshop has been! I just visited the link above and she has not yet posted either, so make sure to check back with Angel as she always has something delicious to share! LOL! Okay, we are on a roll! Linnie has not posted her portion of the blog train yet either, so bookmark her and head on back later tonight or tomorrow as we do like to give everyone a full 24 hours to post as we are coming in from all around the world! This was my first visit to Linnie's blog. Be still my heart. Girl's got game and can she design some scrumptious stuff. You might wish to peruse her blog while there downloading after she has posted. Beautiful showcase of layouts too! Okay, since none of the above are on this ride through Scrapland yet, if you need to get back to the Blog Train Blog where all of the links are, click HERE. See you shortly with my portion of the goodies!